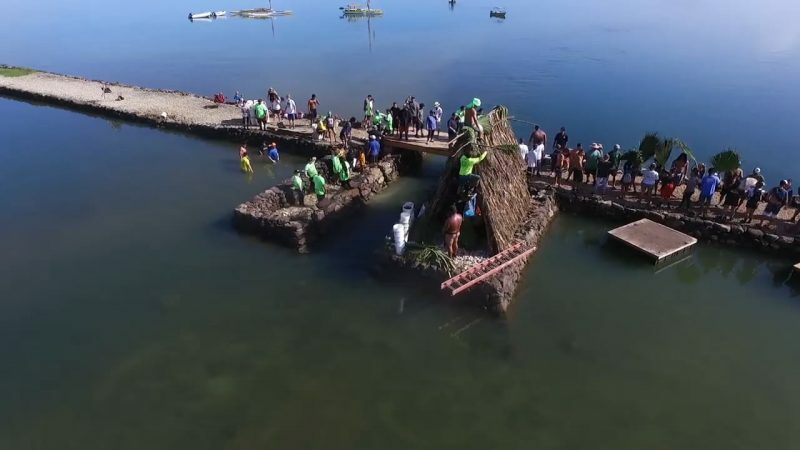 Paepae o Heʻeia put a call out for 1,000 people to help Pani ka Puka, or close the gap, in a portion of the wall that was destroyed 50 years ago due to a flood. Two thousand people answered that call. “We’ve never had more than 400 people on site,” said Hiʻilei Kawelo, founder and executive director of Paepae o Heʻeia. “I’m excited to see people from all different circles, ʻohana, people that have been coming here for fifteen years since we’ve been around, people that are brand new, people that are malihini. The nation of Hawaiʻi is built upon basically this ʻāina and inclusive of all people. I’m excited to see that. I don’t really know how it’s gonna actually go until it goes,” said Kawelo. “You know when your kūpuna call you to action for whatever reason you just do it and we’re sort of freaking out about today but we know that it’s gonna be good and it’s gonna end with a fishpond that is mākaukau to receive fish,” said Kawelo. “We anticipate about 2,000 people that will be lining our kuapā and helping us to solidify the strength of our kuapā, so thank you again for being here from the keiki all the way to kūpuna, mahalo, mahalo, mahalo. 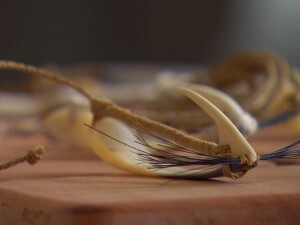 “This is something of great magnitude, it hasn’t happened for over two hundred years and it’s a really important time for us to take pause and to remember and to be reminded of the genius of our ancestors, it is because of them and their legacy that we have a blueprint to live more sustainably,” said Paishon-Duarte. 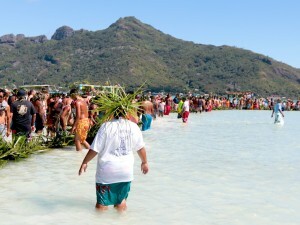 The volunteers were sent out 200 hundred at a time, 50 per alakaʻi, to line the kuapā. The line started at the gap, where two walls were built on either side of it and a bridge over it. This would be the new mākāhā once closed by gates at the end of the day. From there volunteers filed in until the line reached the shore where five-gallon buckets sat next to a mound of coral waiting to be filled. Once the 2,000 people were in place, the work began. Volunteers and alakaʻi shoveled coral into the buckets and passed them down the two staggered lines. At the end of the line, the coral was dumped into the two walls to fill and level them out. Wooden rafts in the pond were also used to push buckets and large pōhaku from the shore to the puka and back. Every now and then there was a break in the buckets and large palm leaves were passed along to finish the new hale kiaʻi next to what was to become the new makahā. As volunteers worked together, they shared why they came out to support Paepae o Heʻeia and what they thought about the day’s event. “You want to be able to provide food for this community and I really think this fishpond can do that,” said Jordan Nelson. 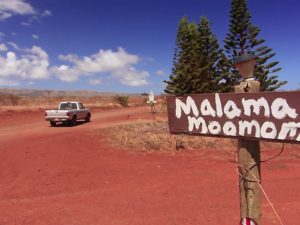 “We come from up mauka in ʻIolekaʻa so our water meets this fishpond. It’s our inherent kuleana for us to keep this relationship from mauka to makai going,” said Mālamanākoa Camvel. “It’s gonna benefit so many people and future generations too so our work today is only gonna benefit for the future and that’s the main thing,” said Kapono Chang. “I came out here to give back, give back to the ʻāina,” said Analia Furman. “We were taught that this fishpond is over 800 years old, the United States of America’s not even close to being that age so there’s a lot of history. For some of the kids they’re Hawaiian, for some of them not, but all of them have an opportunity to give back and be part of the community,” said Val Espania. 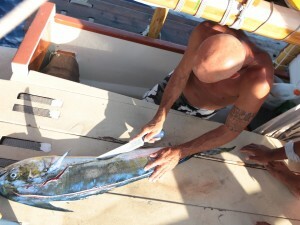 “It’s beyond words, you can bring people from all over the islands, we just met a couple from Waimea on the Big Island. That’s what mālama ʻāina and mālama honua’s all about, bringing people together no matter where we’re from,” said Kapono Chang. “Ua hiki mai au me kekahi o kaʻu mau haumāna hula i hiki ke hōʻike iā lākou ka hana i hana ʻia ma ka wā kahiko, lawe mai iā lākou. Hoʻāʻo au ma o ka hula e kākoʻo iā lākou e ʻike i ka hana o ka poʻe i ka wā kahiko i hiki ke hoʻomau ma nā hana o kēia au,” said Lahela Igarta. Keliʻi Kotubetey, founder and Assistant Executive Director of Paepae o Heʻeia, also shared his thoughts about the day. “What today stands for is the power of the Hawaiian spirit, the power of Hawaiians being in charge of their own destiny and their places, places that feed them and have fed us for years. And the way that that’s been done is a kākou effort. Laulima, many hands,” said Kotubetey. Ua pani ka puka! The 50-year gap was closed. As the workday came to a close, Paepae o Heʻeia alakaʻi reflected upon the day. “We gotta return this kind of practice to normalcy and what it did was that it pointed out that we need a lot more practice,” said Kawelo. “Hopefully later we get better and better. Try for push at least we got the gate out… Fifty years ago never had one connector like this, so now at least we can say fifty years worth, finally connect them in our time,” said Peleke Flores, Kū hou Kuapā Coordinator at Paepae o Heʻeia said. “I’m overwhelmed because I don’t know what the future holds for this fishpond. I have high hopes but I know it’s gonna be something awesome,” said Kotubetey.